Sometimes you see a set and you just fall in love. Well this ‘You Are Not Alone’ set is one of them. Sometimes it’s so easy to explain and sometimes it’s not, it’s a feeling that a set gives you and that’s exactly what’s going on with this set. 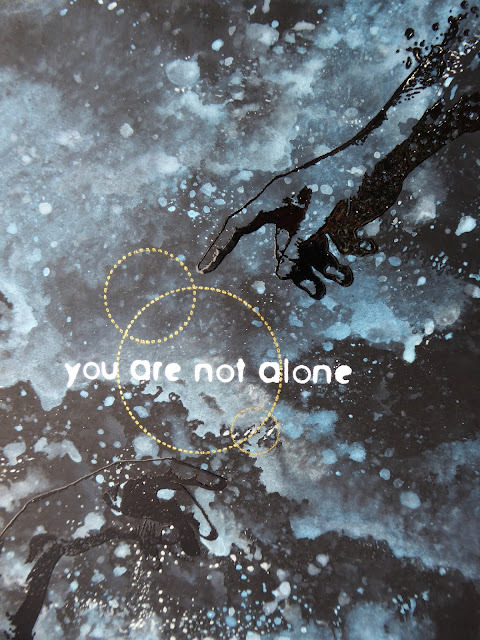 Do you know someone who needs reminding that they are not alone? Make sure you tag us on instagram or show us what you have created with our stamps and stencils in our Facebook group! We’ll be back tomorrow with a fantastic dance themed card from Sharon, and Pauline has been daydreaming…!! Thanks for visiting our blog, have a lovely evening. Seeing the new set from Visible Image with those beautiful hands… they sure touched something inside of me. They speak to me and I want to go and create some things of which I can’t even say why I’m putting certain elements together. For today’s project I do know what started my project. Looking at one of the hands I immediately thought of a puppet player. So I just knew I wanted to have something hanging on the hand. But it wasn’t until I started my project that I found the perfect elements. I hope that, when you are dangling on a thin thread, you find the strength inside of yourself and remember just how strong you are. Subscribe to Veerle’s YouTube channel. We’ll be back later with a fantastic card from Sharon! Hello and Happy Sunday to you! We are so excited to show you the 3rd preview from our Wonderland release! How can you resist that grin?! The quote is so true, and can be applied to many situations in life, and of course we just had to add in ‘We’re all mad here!’. You can pre-order these fantastic stamps next Friday, July 20th! Come back tomorrow to see who’s up next! Hi there! We are popping in to show you the second preview from our Wonderland release! How awesome are these stamps! The numbers will create fantastic backgrounds for the white rabbit, and can be used to personalise Birthday cards too! And how great is this quote.. don’t we all rush around trying not to be late!!! Who will we be introducing tomorrow??? Pop back then to see who it is! Afternoon! Thank you for visiting us here on the blog today. We have a weekend packed full of amazing inspiration from our wonderful Design Team! It has been so busy since getting back from Creativation, so we are having a huge catch up of all the latest cards and projects created with our gorgeous NEW stamps! Here I am again, sharing a couple of cards that I made with the awesome new stamps from ‘Visible Image’, If you followed Helen and Mark’s progress in Phoenix, you will know what a fantastic success they and their products were, everyone loved all the Visible Image collection, they were definitely flying the flag for Britain. 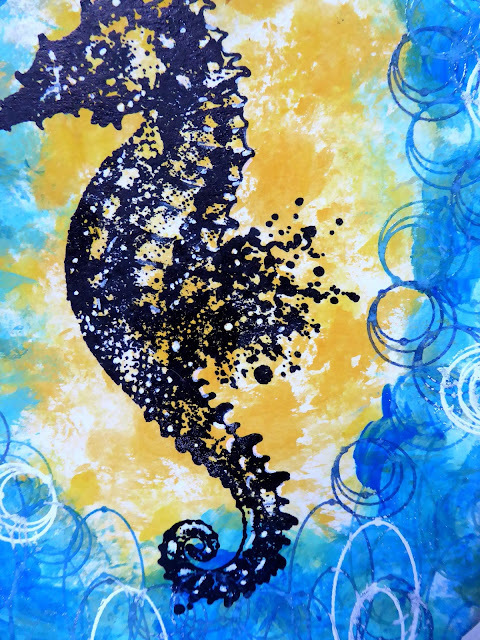 I stamped and fussy cut the seahorse, then coloured it. 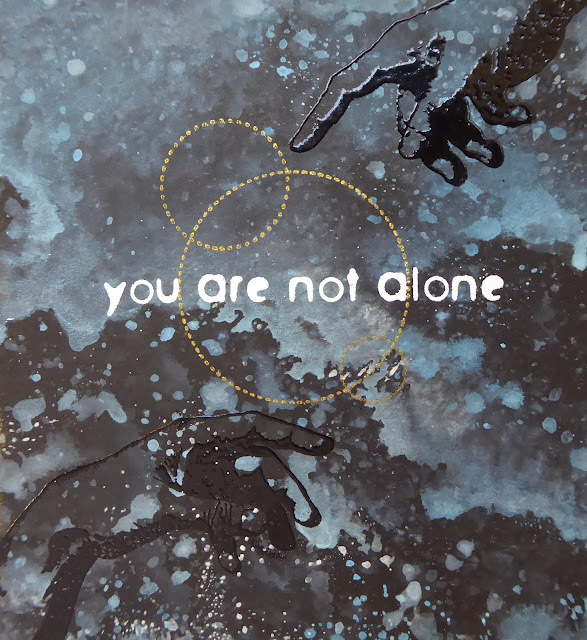 I heat embossed the Organics onto acetate, and fussy cut, I also did the same with the sentiment, but onto blue card. 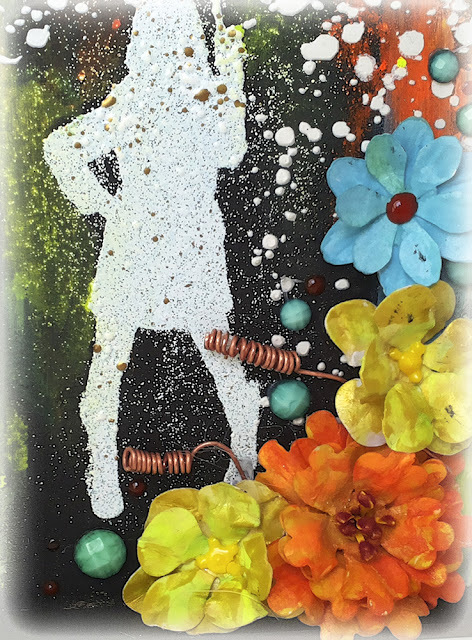 The background was achieved by adding acrylic paint, onto the card with a palette knife, adding the stencil, and pouncing through with some white acrylic paint. I then stamped the fish and the organics stamps.To finish off, I added the fussy cut components with some 3D glue gel. My next card was a little play for fun, I used some Distress Inks, along with the ‘Organics’ stamps as trees and bushes. 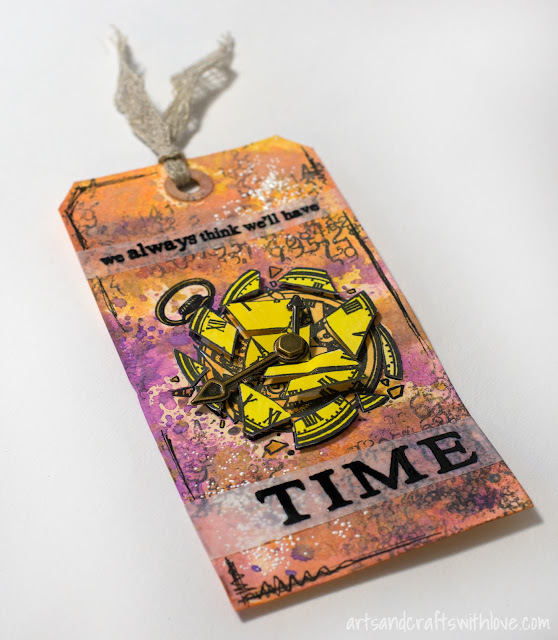 The other stamps I’ve used are..
We will be back later with a stunning tag from Veerle Moreels! Hello! 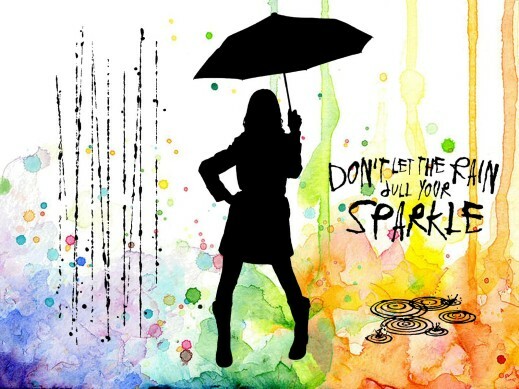 Hope you are enjoying all the inspiration we have been sharing today! It’s been incredibly busy lately with nowhere near enough hours in the day.. so we are having a mega catch up here on the blog this weekend before we get back to normality, and daily inspiration! Welcome to another dose of Visible Image stamps inspiration. 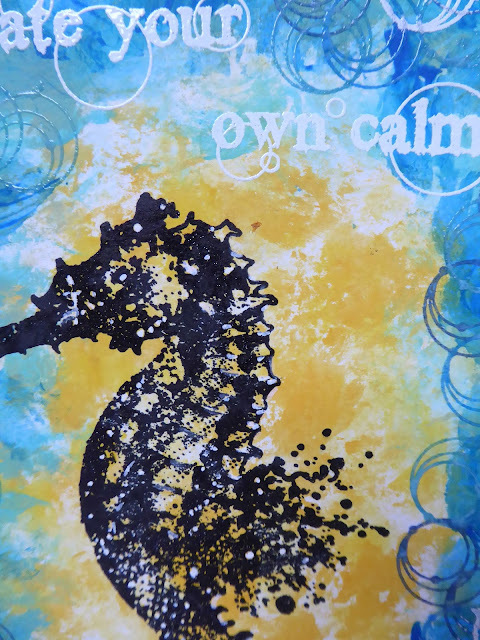 Today I am sharing another creation of mine using the stunning ‘Create your Calm’ stamp set. This is the lovely stamp set I worked with.. I used all the stamps in this set, the little waves/bubbles make such a cool background. 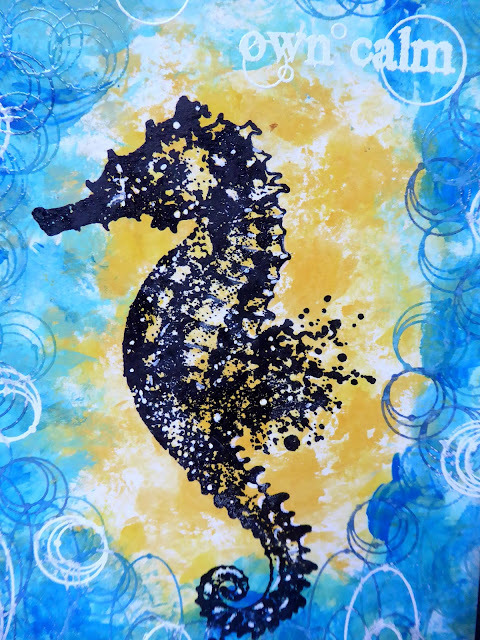 I stamped my sweet seahorse in the sunshine using Versafine Clair ink. I then embossed the waves in white and blue and the sentiment in white. I made a “frame” for my picture using photo corners. This really is such a delightful stamp set to work with… and it makes me long for summer to hurry up and arrive too. Thanks for stopping by today and for the kind comments you take the time to leave me, I really appreciate every single one. Have a lovely weekend… It feels so good to be in February, the days are definitely starting to get lighter. Have a great evening, we’ll be back tomorrow with more gorgeous cards and projects from the team. Hello! We are back with more gorgeous inspiration for you! 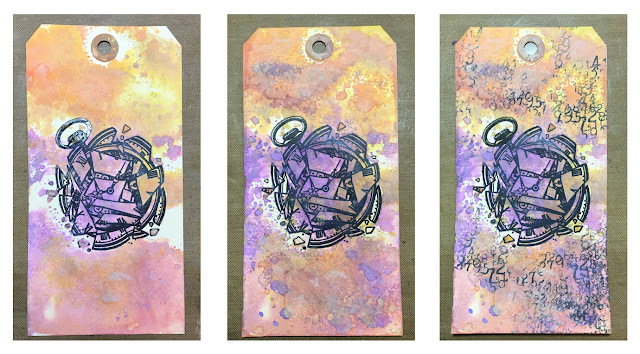 You’ll all know, as crafters/artists, that when you find a product you love that it’s really hard not to use it in all your makes… and that’s kinda how I feel about the gorgeous ‘How Fragile’ and ‘Organics’ stamps from Visible Image. 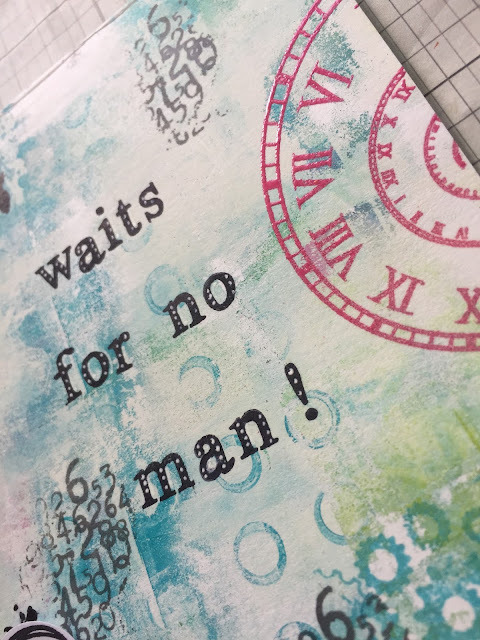 I wanted to make to make a card using both stamps and so to begin, I heat embossed the smashed stamp in Wow!’s British Summertime embossing powder which is a gorgeous grey colour. To join the stamps up was a little tricky but I used the Tonic/Tim Holtz stamping platform (which enabled me to line the ‘Organics’ stamps exactly where I wanted them) and then I carefully joined the two stamps together using a Wow! embossing pen to make it look like a natural flow. 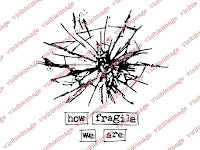 ‘Organics’ flows seamlessly into the cracked glass from ‘How Fragile’. Before adding the colour, I’ve dabbed the Fibonacci stamp around to add some extra detail and heat embossed it in bright white, so it contrasts with the other stamps. Then comes the fun part… getting inky! I loved adding the colour. I’ve spritzed the watercolour paper so it draws the colour into it and used a pipette to drip the colour into the specific areas, using a paintbrush for the smaller compartments. Before adding the sentiment, I’ve spritzed some Tattered Angels Glimmer Mist in Crocheted Doily and a light flick of watered down gesso. 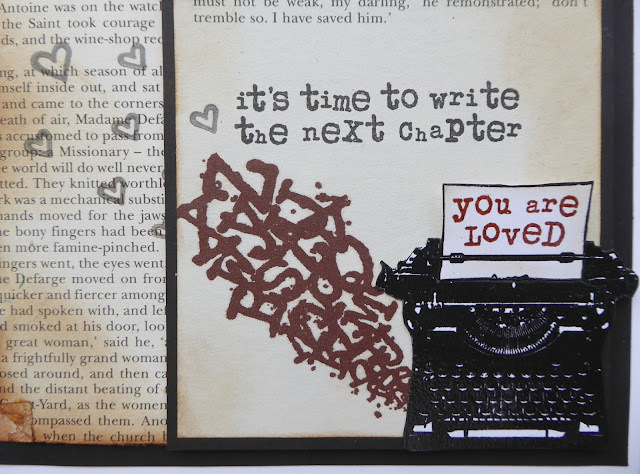 The sentiment itself is heat embossed onto a grey/black washed background and added to the card using foam tape. To finish, matt onto black card and then onto a card blank. I particularly love the colour in this card… I’m all about the bright colours at the moment (I think it’s because I’m bored of the grey, dreary days of Winter). 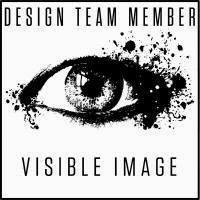 Do browse the Visible Image Blog to see all the other DT’s projects and makes… they are all stunning!! That’s all from me… see you next time! We will be back soon with more projects from our amazing team later this evening! Stay tuned!!! Hi there! Wow is it Thursday already?! This week is flying!! Just 5 more sleeps until we fly off for very exciting adventures in Phoenix! Today we are previewing more exciting NEW stamps.. Launching at Creativation next week.. Dramatic comedy and tragedy masks with an awesome quote! These awesome projects will be blogged soon.. so keep an eye out for them! All our exciting new stamps are (of course) all designed by Mark Alexander! If you are heading to Creativation, you will find us @ Booth #539 in the International Pavilion! Come back tomorrow to see the final 2 previews! You won’t want to miss them!! THEN.. tomorrow you can pre-order all our NEW stamps!! Yay! Thanks for checking out our Day 4 previews today.. if you missed Days 1 to 3 you will find them HERE! 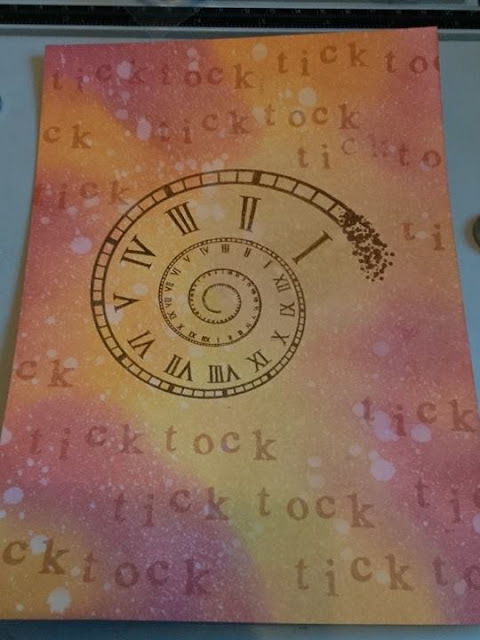 I’ve been playing with the fantabulous Ahead of our time and Alphabetical stamps from Visible Image, making up my own quotes using the letters, and backgrounds too…can you see the tick tock? 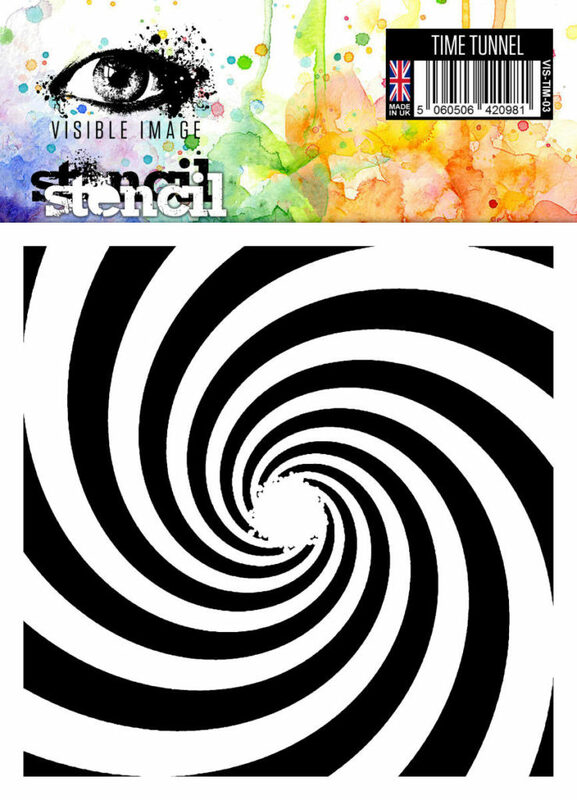 Look into the image! Having all these possibilities allows you to really get creative. No constraints, no restrictions…think of something to say and say it!! I inked up my backgrounds with distress oxides and splashed the card with water to get the bleached-out effect. I stamped my main feature with brown Nuvo Hybrid ink, I love this ink as you don’t have to think about what pens to use with them -it’s untouchable, there’s no ‘wrong’ medium to use! Alcohol or water-based pens – they can’t touch it! I formed the words with the stamps. They look quite lively here, but once all the other elements are added they will become more of a background. The masking of the frames from the alphabetical set resulted in a funky display of boxes into which I stamped my required lettering. Adding extra stamps from the set, in dark colours, and shading from the outside in with distress inks, adds, I hope, to the depth of the image, or at least that’s what I tried to create! I also masked over the whole of the ‘MAN’ boxes to bring the letters to the foreground. 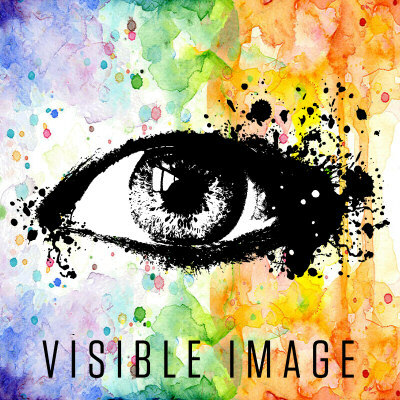 And tag us on instagram @visibleimagestamps and on twitter @visible_image! Thanks so much for stopping by today, hope you are having a great weekend so far. We’ll be back with more fantastic inspiration tomorrow. So, how do you like the new stamps? I love the time themed sets and have created a zig zag book to show off the wonderful words in the set. 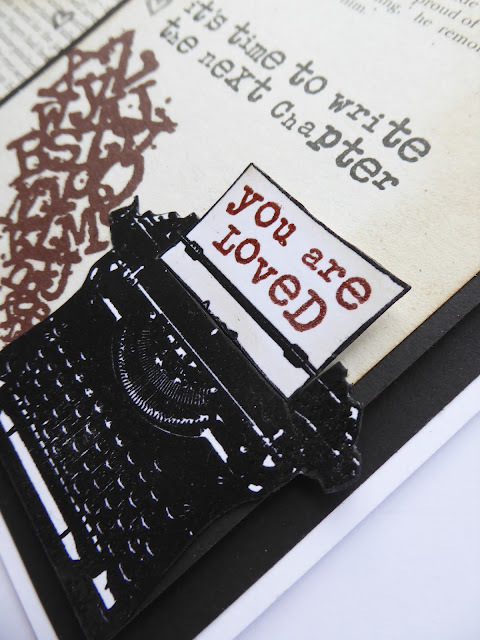 The sentiments are stamped with Ranger Archival Ink. We hope you will play along with our DIMENSION challenge this month over in our Facebook group, for your chance to WIN a £40 coupon! 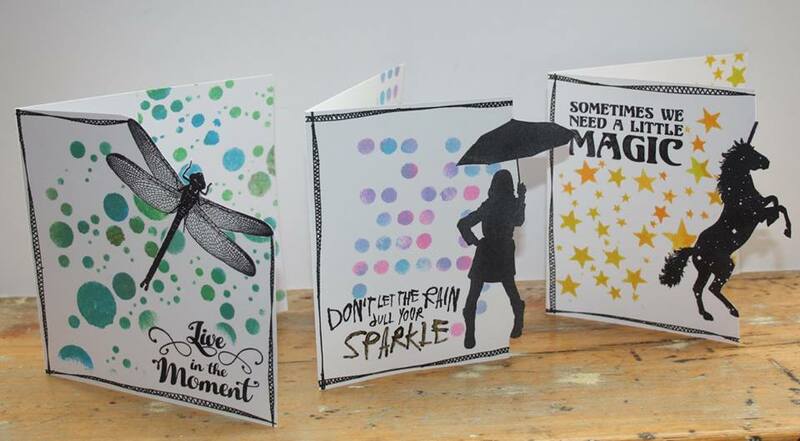 Or share anything you have created with our stamps this month in our ‘Show & Tell’ album for another chance to WIN! We will back later with some stunning projects from Pauline, demo’d on our recent Create and Craft TV shows! Hello! Another hot and sunny day here in South Wales today! But at least there is a little breeze today! 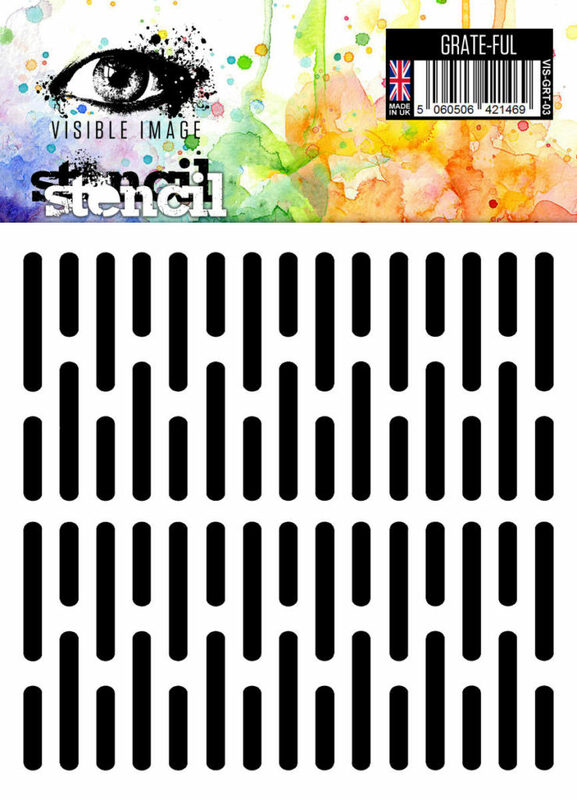 Today I have a card to share which I made for with some of the new Visible Image stamps. I love them… so many possibilities. I stamped the clock on it first then added the birds. 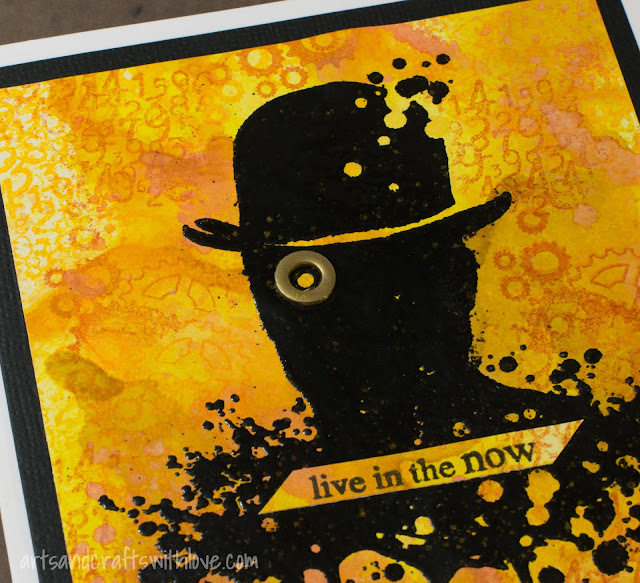 I added splatters and doodling in white and black and added some background stamping too. Lastly I stamped the sentiment on white card, matted it on black card stock and glued it to the card panel. Lastly I adhered the panel to a white card. 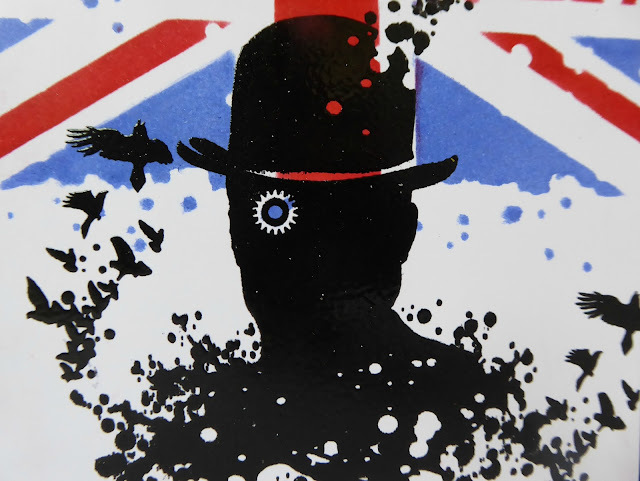 We will be back with an incredible new card from Dot next.. yes you guessed it… created with our NEW stamps! Thanks for stopping by today, hope you’ll pop back later. The new stamp sets really are awesome! 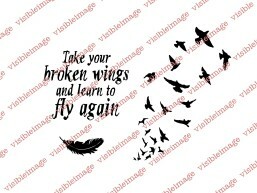 They are larger sets, A5 size, and there is so much you can do with them. I was like a kid in a sweetie shop, as I had so many ideas, when my sets arrived. I received the new stamps hush/hush a couple of weeks ago to make some samples with and today I am sharing my first project. I was aiming to make a galaxy with my inks. 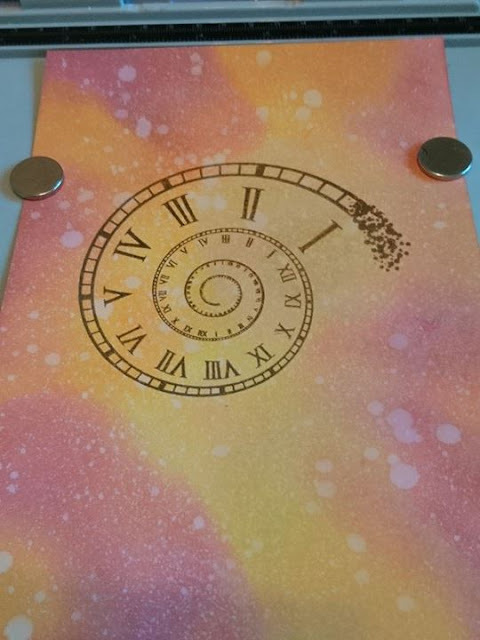 I die cut 4 panels using my ancient but much loved Sizzix accordion die and added some stamping around the edges using the cogs and spring stamp which I gold embossed. I stamped and decorated each panel centre. These words were white embossed. 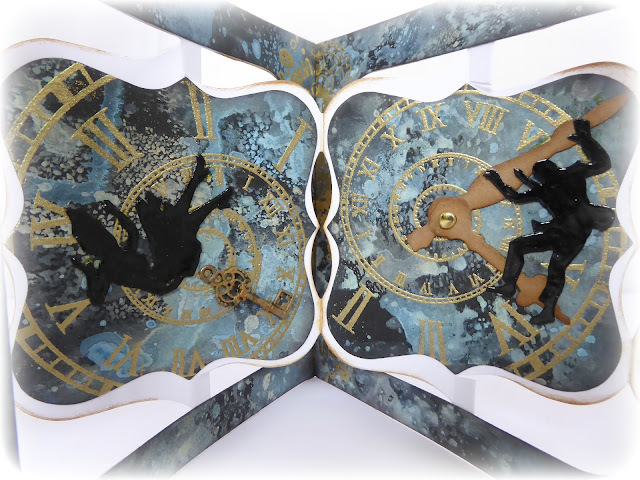 I loved adding hands to the time swirl from the Ahead of time set..I fussy cut and embossed the falling man and woman; he is just about holding on to time ? but I think she has slipped into the vortex….I wonder if there is a black hole out there…? 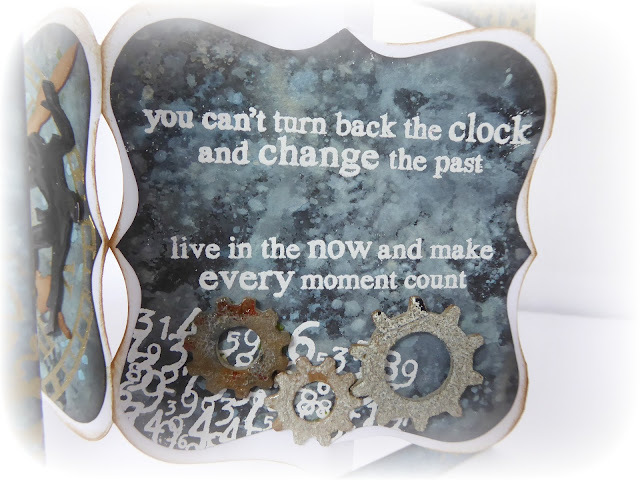 I made myself some die cut cogs too which I altered with mixed media products and finished my card with these great quotes from the Somewhere in Time set. As a member of their Design Team I get a real buzz seeing my work on television. 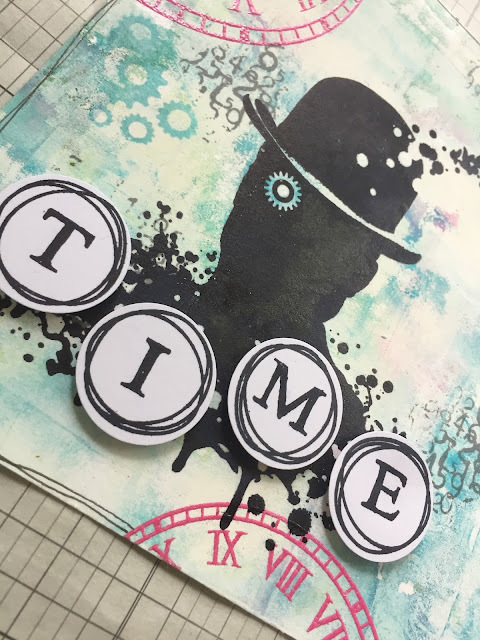 I made 2 other “Time” projects for the show, which I will be sharing very soon. I was waving to them on TV. Thanks so much for stopping by today and for all the very kind comments that you take the “Time” to leave…pun intended ? I hope you got a chance to see the show..or set up your recorders to watch at your convenience. 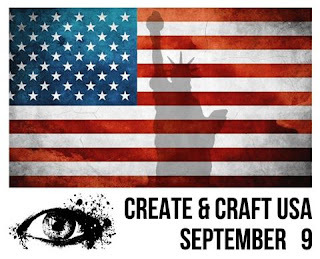 You can still watch on ‘catch up‘ over on the Create and Craft website… but today is your last chance! (You need to search for the June 9th shows). Incredible project Jane… absolutely superb! Stunning background and the addition of the clock hands is awesome! 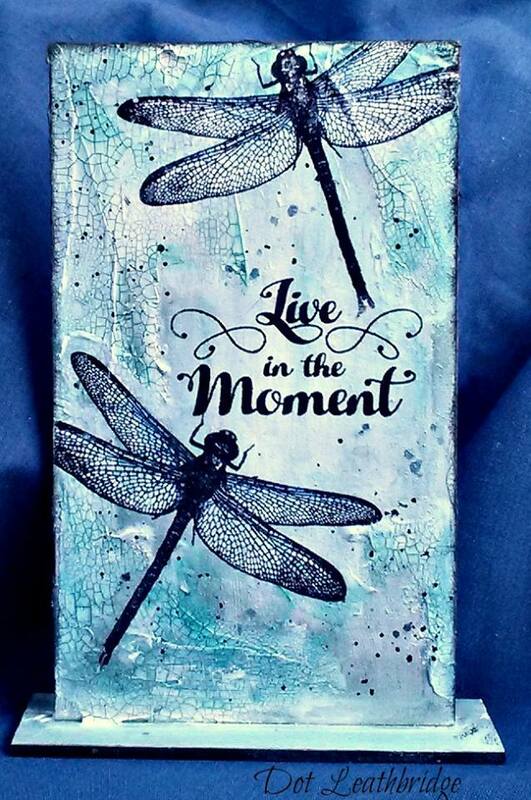 You will find loads of gorgeous inspiration from Jane over on her blog. Facebook group join in with the banter and enter our Monthly Challenges… great prizes on offer! Hello! 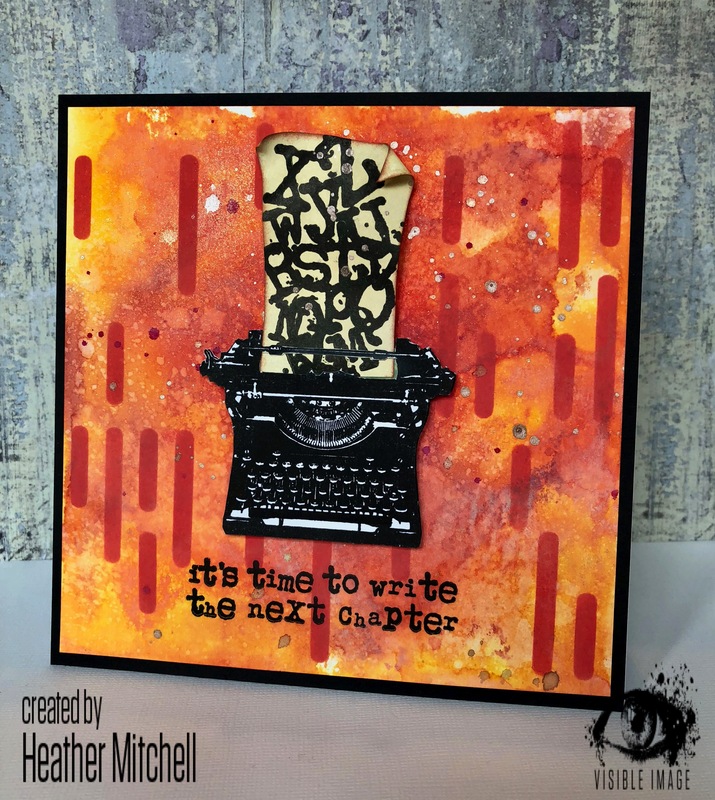 We have another incredible project to share with you here on the blog today, created with our BRAND NEW stamps which you are loving… thank you! 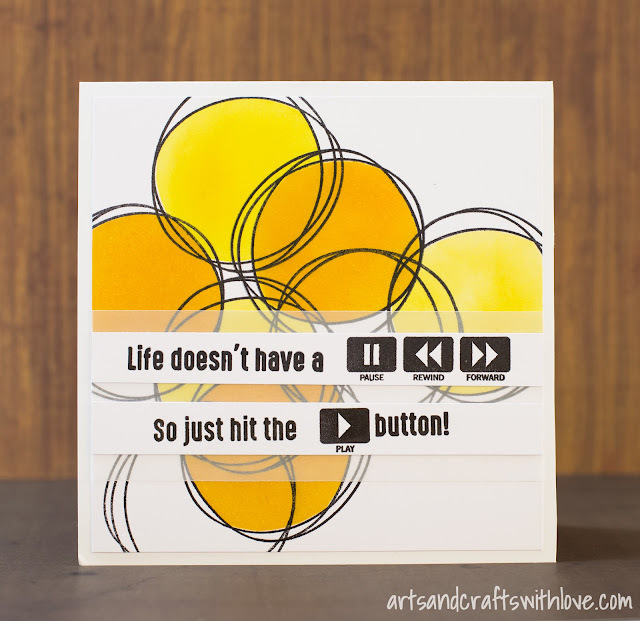 Today I’m sharing a card made with some of the awesome new Visible Image stamp designs, which are now officially released! I used Oxides on the background, and raised the people and birds to give dimension to the card. The alphabet is a ‘must have’…with doubles of the lower case letters it makes personalising your projects so easy! The font is brilliant as are the scribbled frames! As all our initial stock of ‘Ahead of our Time’ and ‘Somewhere in Time’ sold out in record time, so there’s a little wait for more stock to arrive… but it won’t be too long now. Don’t forget to enter anything you have made with our stamps this month into our ‘Show & Tell’ challenge, or play along with our DIMENSION themed challenge… both have great prizes up for grabs over in our Facebook group! We still have lots more to come on the blog today… our Design Team are absolutely loving creating with our NEW stamps! Hi there! 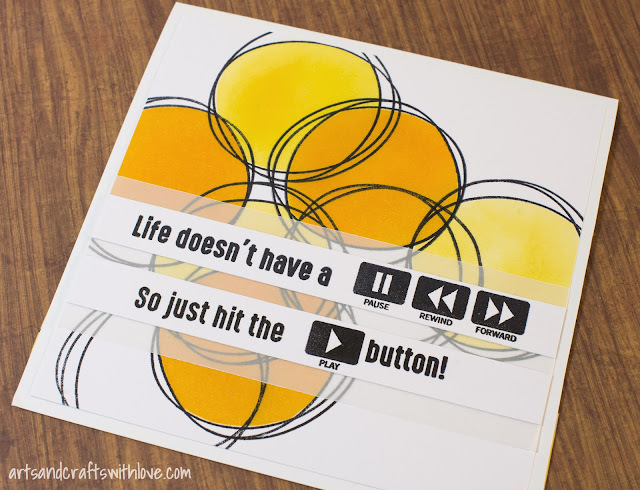 Helen here sharing some NEW stamps inspiration from me today! I created this pretty much as soon as the new stamps arrived here, as I could not wait to get my hands on them. which turned more of a copper colour on my background which I really like. white dylusions paint and added randomly. I used some diluted white paint to create a glow on the jellyfish. Lastly I stamped and embossed the beautiful quote using white embossing powder. I really love it ♡ Hope you do too! Pop back soon for more fabulous inspiration from our amazing team. 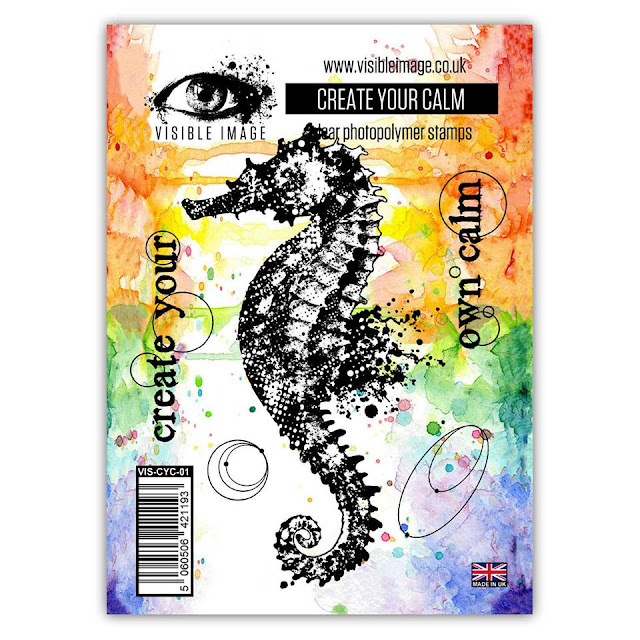 new release stamps from Visible Image, and this week I have been playing with the cool Face It! and Own It! sets. I wanted to create a funky 80s feel by colour blocking over the features. 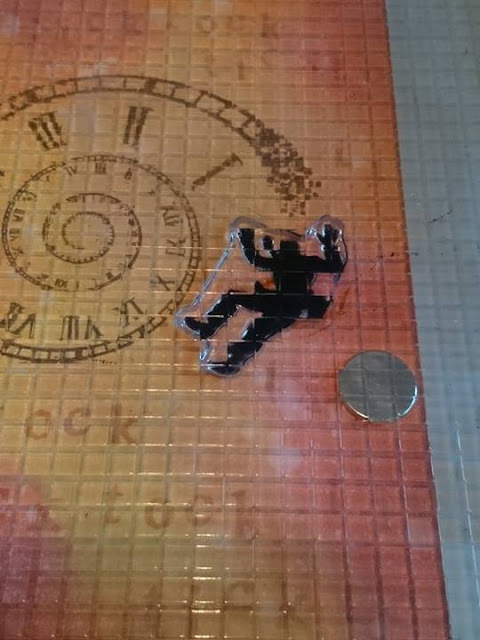 then used a square punch to cut my rectangular stencils. I created then extra detail was added with a ‘halftone’ stencil and black ink. The words are coloured with Tonic Brush Script pens. 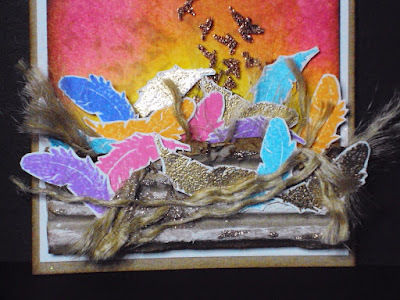 You will find more of Teresa’s amazing cards and projects over on her blog. and the rest of the team too! Final Reveal – Introducing… FACE IT! Hello there! Thank you for visiting our blog on this very exciting day! If you have been following us on social media over the past few weeks you will have seen all the exciting previews of our NEW stamps. We hope you are loving what you have seen so far… we have received so many amazing comments and messages, it’s absolutely brilliant! So today is the final reveal, and we are incredibly excited about this collection as we have been working on it for quite some time. Amazing words and sentiments to ‘own’ the look you have created! 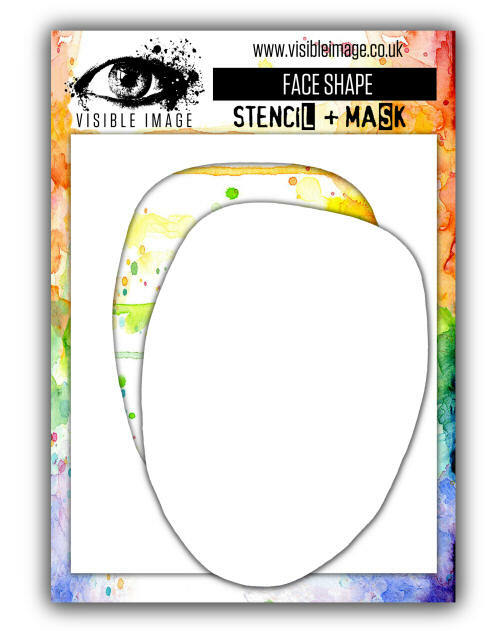 Cover your face with the mask to protect it when splattering paint on your background! over the next few weeks to inspire you further! If you have a store and want to stock our stamps please get in touch! Thanks again for visiting us here on the blog today..
we hope it’s not too difficult to choose which stamps you will be ordering first!!! Have a fantastic day, we are off to get inky and will share the results with you soon.. So it’s time for preview #16… and it’s a must have quote for anyone who loves to create! Come on over to our Facebook group to join in the chat about our NEW releases! There may even be a sneak peek over on Facebook this evening!!! Thanks so much for visiting us here on the blog today! We hope you have an awesome day. It’s the penultimate day of our NEW stamps previews here on the blog! We have just a few more awesome things to show you now! We absolutely love our curious cat face! ♡ Hope you do too! See you back here later for preview #16… an awesome quote for anyone who loves to create! Thank you for visiting our blog, and have a fantastic day! Hi there! It’s the final week of NEW stamps previews and we are so excited to show you the rest of our February release! Today is Day 14… and it’s a gorgeous sentiment. Thanks so much for visiting our blog today! Hello! It’s Day 13 of our NEW stamps previews here on the blog! Very excited to share today’s preview!!! And of course the gorgeous inky script from our NEW Scripted Streets set will be stunning with our INKredible horse! Hi there! It’s the final week of previews and we are super excited to show you the rest of our February release! 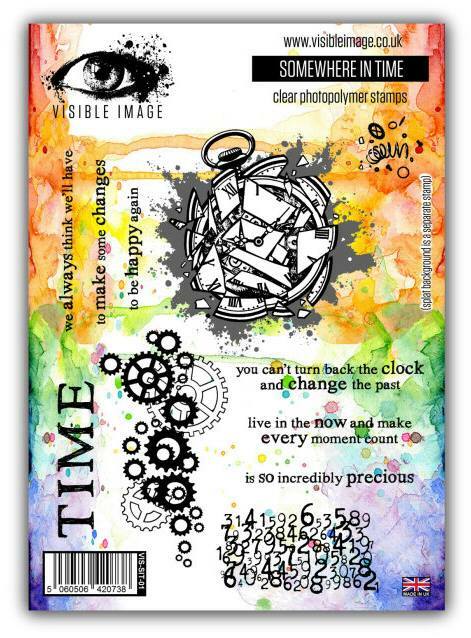 Today is Day 12… another new quote stamp we think you will love! 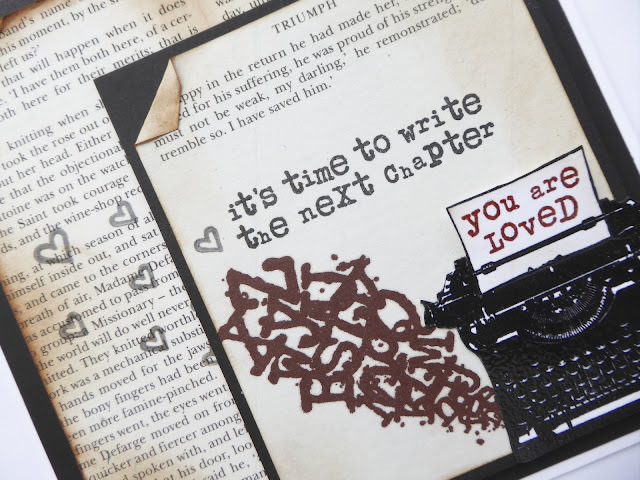 Awesome words for journaling and mixed media pieces! We hope Monday is gentle with you. Hello there! It’s Day 10 of our NEW stamps previews here on the blog! Today’s preview is a beautiful sentiment stamp. Hello there! It’s Day 9 of our NEW stamps previews here on the blog! How cool are Mark’s paper boats and paper planes!!! And great words you will use and use! See you back here tomorrow for preview #10. Hello there! It’s Day 8 of our NEW stamps previews here on the blog! Today’s preview is another new quote stamp. See you back here tomorrow for preview #9… can’t wait to show you it!!! Hi there! It’s Day 7 of our NEW stamps previews here on the blog! 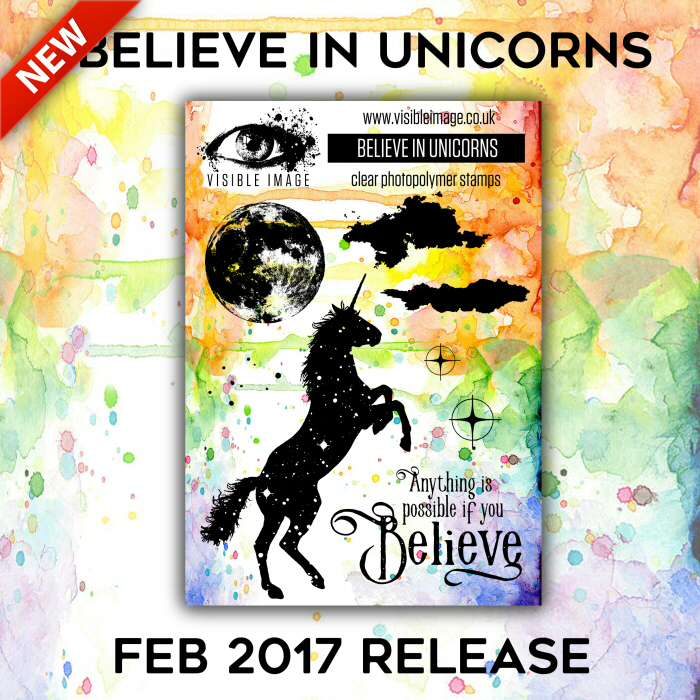 Today’s preview includes our amazing Unicorn stamp which is back in a stunning new set. Just look at that moon… ♡ and the clouds… and that fabulous quote! See you back here tomorrow for preview #8. Hello there! Wow it’s already Day 6 of our NEW stamps previews here on the blog! Today’s preview is the next of our new words stamps. Fabulous statement! 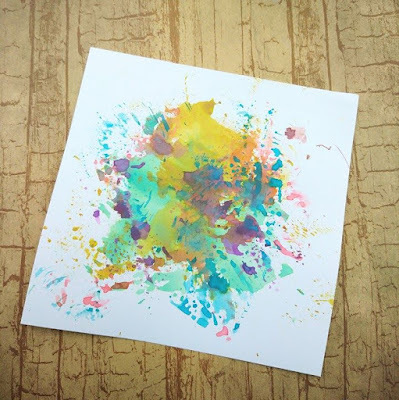 ♡ Great for your art journal! See you back here tomorrow for preview #7. Hi there! It’s Day 5 of our NEW stamps previews here on the blog! Today’s stamps take us under the sea! See you back here tomorrow for preview #6. Hello! It’s Day 4 of our NEW stamps previews here on the blog! Today’s preview is the second of our new words stamps. 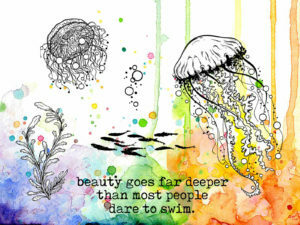 Gorgeous words and design ♡ Hope you love it! See you back here tomorrow for preview #5. Hello there! It’s Day 3 of our NEW stamps previews here on the blog! our awesome light bulb stamp is making a come back! Some clever designing by Mark going on here! And we both love the quote, as it has real meaning for us. 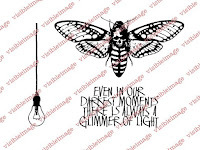 This set works brilliantly with our Glimmer of Light set which contains our awesome moth! See you back here tomorrow for preview #4. Hello! It’s Day 2 of our NEW stamps previews here on the blog! Today’s preview is the first of our new words stamps. Such a cool quote! We love it! See you back here tomorrow for some stunning inspiration from Nicky Gilburt, and for preview #3. Hi there! We are incredibly excited to start previewing our NEW stamps here on the blog today. We will be showing you something from our February release every day, from now until January 27th! Are you already imagining what you will create with her? We hope you love this set as much as we do! See you back here tomorrow for some gorgeous inspiration from Pauline Butcher, and for preview #2.
and everything is still designed by Mark. so as always they stamp beautifully. and the waiting time for orders was long. will now be dispatched the same day! You will find ALL our current designs HERE! Sadly due to family commitments we aren’t at the Hobbycrafts show at the NEC this year. We will really miss seeing all our regular customers at the show. Thanks again for taking time to read about all our changes. We have lots of exciting plans for the next year! 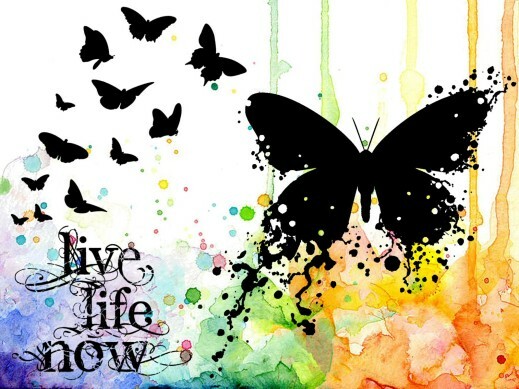 Now, I know not everybody loves skulls…but why not make this project using only butterflies, flowers or a beautiful colored in piece and use bright colors. This idea can be made in different styles, and these monoliths give you so much possibilities. 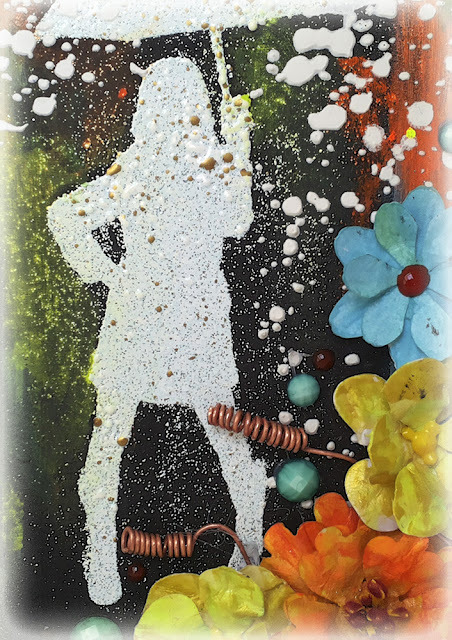 If you are looking for some inspiration, head on over to the project gallery to see what my talented teamies already made using them. Want to go and create? 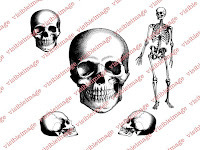 Visible Image send their products without any trouble and very cheap postage too! You can find everything in their online webshop. We hope you are feeling inspired! 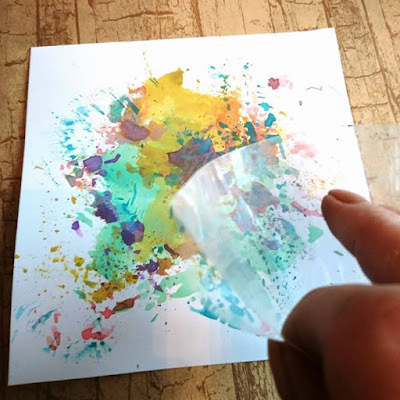 If you are new to trying mixed media, Monoliths are a perfect first step as they are not too big.. just a coat of gesso or acrylic paint and you can stamp away, or simply stick your card or favourite papers onto them! Thanks again for visiting us today and be sure to pop back soon to see what the rest of the team have been creating! We are incredibly excited about this NEW stamp set, it’s our favourite from this release! 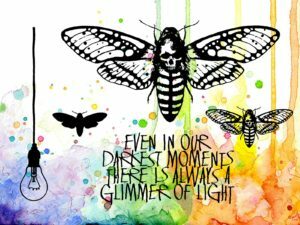 Mark has designed the amazing Death’s-Head Hawkmoth and Helen has written the words, which we think will mean something to a lot of people. And yes, you get the awesome hanging light bulb in this set too! 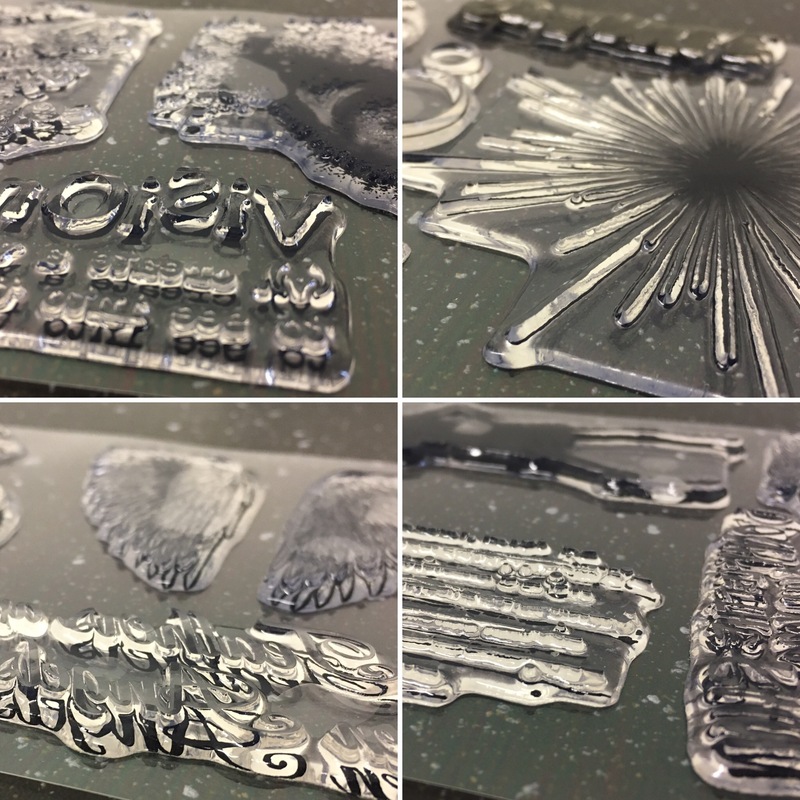 We cannot wait to see what is created with these stamps… something brilliant from Mark is definitely on the cards soon! All our NEW stamps will be available to pre-order from tomorrow, Friday June 17th! And there’ll be a special pre-order offer too! Release date is June 24th. If you want something different… then you are in the right place! If you want amazing quality… you are definitely in the right place! Do not miss the unveiling of ALL our Summer Release stamps tomorrow… including our Christmas 2016 designs! We hope you are loving what you have seen so far. See you tomorrow for a very exciting day! Today we are excitedly sharing the 3rd preview from our Summer Release, and we are bringing back our beautiful small butterfly stamp in a brand new set! 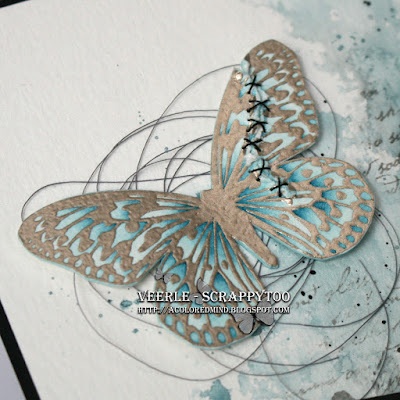 The pretty butterfly is sized perfectly to be layered on top of the inky one! If you missed any of our recent posts, you will find them HERE. We also have some behind the scenes ‘making stamps’ photos over in our Facebook group today… come and join us there! Hope you will pop over and follow us! Thank you for visiting our blog today, there will be another preview tomorrow! Hi! Thank you for visiting our blog! Today is the second preview from our Summer Release, which we are rather excited about! for those of you who like your projects to be a little on the dark side! The smaller skulls will be so awesome for creating backgrounds, and watch this space for a different and very cool way to use the skull!!! If you missed today’s gorgeous Design Team inspiration from Denisa or yesterdays Summer Release preview, you will find them both HERE. See you tomorrow with more wonderful inspiration and another exciting preview! We are so excited to start showing previews of the stamps in our Summer Release! 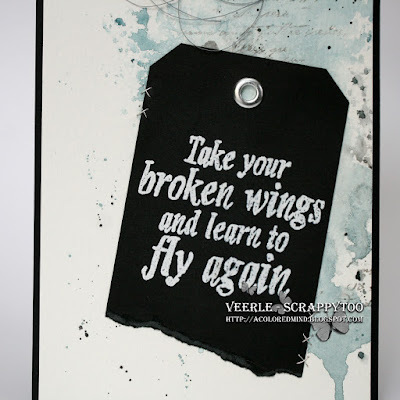 These words are so inspiring, and the brilliant inky silhouette image has such great movement! The design was inspired by this photo..
it was just so great to see her leaping in the air and full of life, after not being able to do any exercise for quite some time! We have lots of different stamp sets for you, including (of course!) Christmas! And, a few favourites are making a come back too!!! Hello and thank you for visiting our blog today! 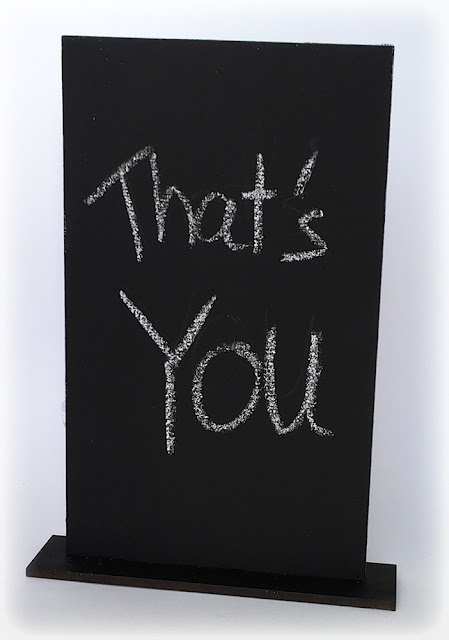 And… they are all about YOU! So which one are you drawn to??? Not to be missed as this is a ONE TIME ONLY offer that will not be repeated! Available to order in our shop from today until the end of May! Hello 🙂 We are back with more brilliant inspiration for you! Have you been following the product release news in the Visible Image Facebook group over the past days? 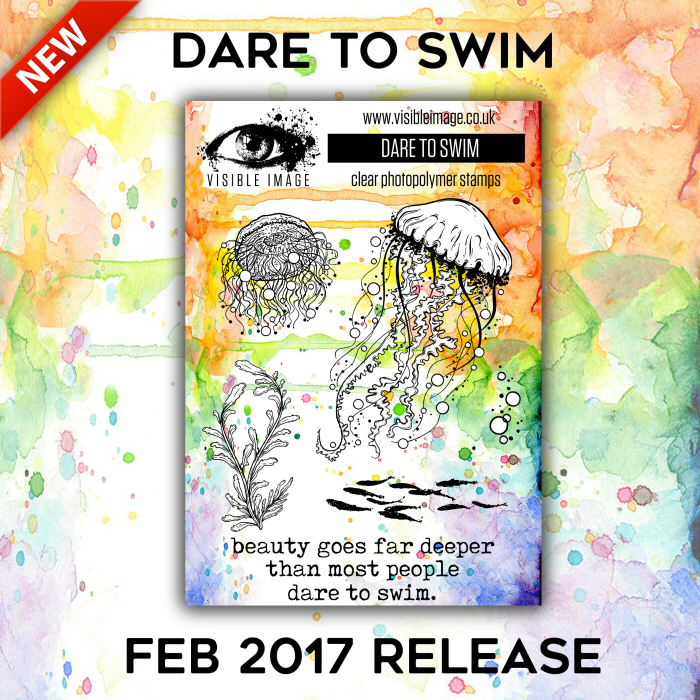 Don’t the new February release items just get your creative juices flowing! If you want to get a good overview of the entire product release just follow this link to see them all! 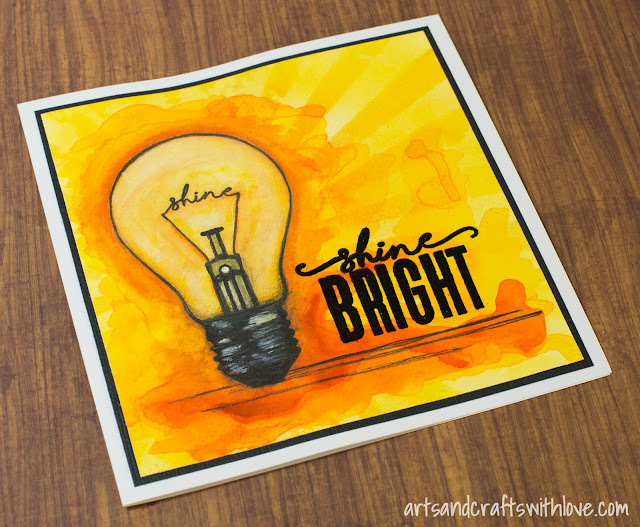 The versatile Shine Bright stamp set was perfect for playing with watercolours. I started with stamping the lightbulb image on heavy watercolour paper, and continued with covering the edges with masking fluid. Masking fluid protected my lightbulb when I started adding yellow and orange watercolours on the background. Once the watercolour was dry I wanted to add more texture on the background, and used yellow ink and a mask to draw light beams around the lightbulb. I finished the card by colouring the lightbulb with water soluable crayons and white gesso, and heat embossed the ‘Shine Bright’ text on the card front. 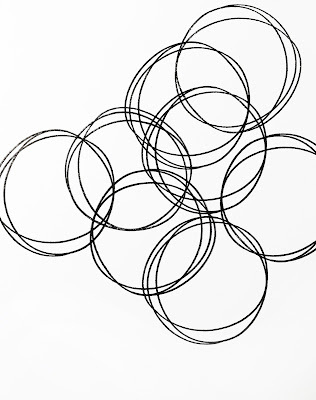 I started the CAS style card with stamping circles on the background. 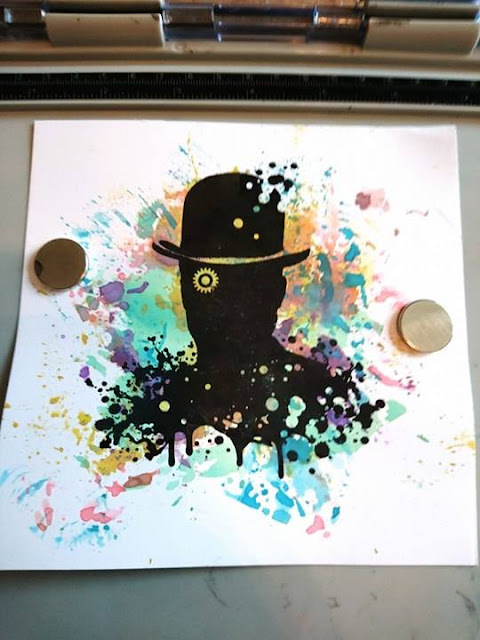 I stamped the image one more time on a piece of scrap paper, cut out the center of it, and used the piece of paper as a mask when colouring the circles. I did not colour all the circles as I wanted the background to have enough white in order to keep the look light and airy. Stamping the quote on two lines only required some masking, as the stamp holds the texts on four lines. For alining the texts perfectly I could have used a stamp placement tool, but I did not mind that the lines were jumping a bit. I used a piece of white vellum as quote background. Vellum is an easy way to calm down a busy background and to highlight elements like this quote text. I often continue the card front pattern on the inside of the card. I think it gives the project a nice finished look. 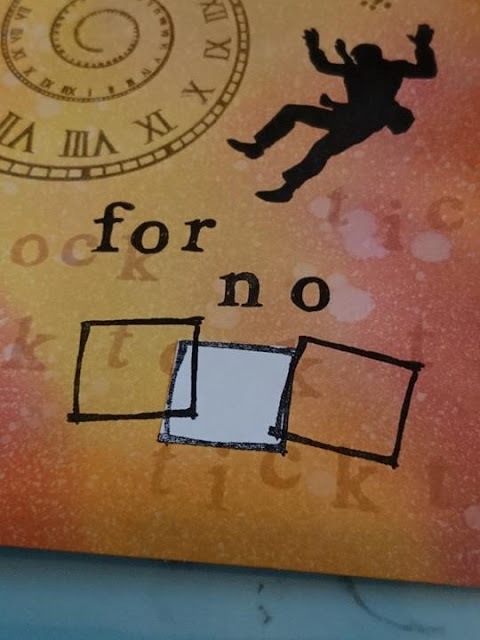 This time I simply cut a slip of white cardstock, stamped the same circles images on it, coloured them with yellow ink, glued the strip on a piece of vellum, and adhered it on the inside of the card. Done! When inking the yellow and orange background of my second ‘Just Hit Play’ card I used a strip of scrap paper as a mask. When finished I splashed some water on the inked surface, and after drying with the heat gun the light splash marks created a nice texture on the colourful background. Then I stamped the cassette image on white cardstock, cut it out, and glued it on a piece of corrugated cardboard. 3D stickers would have worked just as fine, but cardboard is a much cheaper material when you need to lift a larger element from the background. Under the cassette there’s some black sewing thread that I glued down with tiny glue marks. I’m sure I will use both of these new stamp sets not just for creating more cards, but also for decorating my scrapbooking layouts and art journal projects. The images are stunning, and I know they both will be a big hit! Wishing you a nice and bright day! Wow! Totally awesome cards Elina! Thank you so much ♡ Amazing work with our NEW stamps! Loving all the yellow and orange tones and the retro feel to these cards. We will be back tomorrow with more fantastic inspiration! Good Evening! We are back with our second dose of awesome inspiration here on the blog! Fantastic card Kim.. love the background and your super shiny bulb! I’m sharing my first Monolith today! It’s a mdf stand alone Monolith. Perfect for mixed media. I love it. And a bonus is, you can decorate both sides! So you can turn it from time to time! For my front I used black chalkboard paint and covered the whole surface. 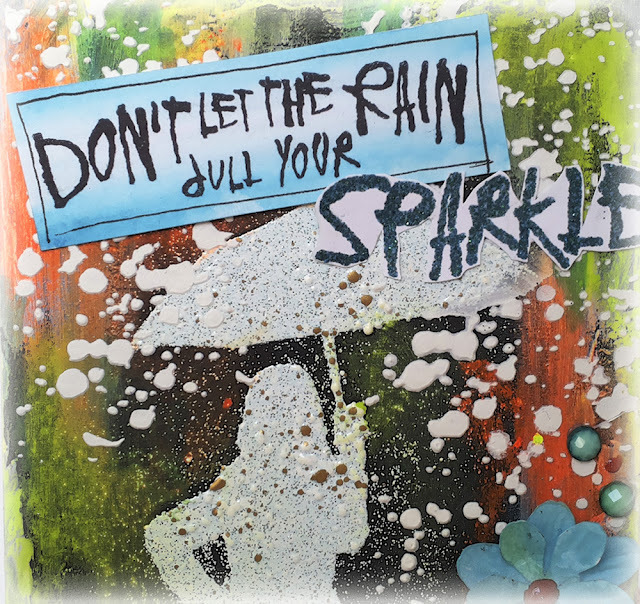 After this was completely dry I used Fran-tage embossing enamel together with the “Sparkle in the Rain” girl. To get a good coverage I embossed it two times. That means: Immediately after the first layer is melted you add another layer of powder. It will stick to your first impression, because it’s is still hot. You have to be quick, but keep in mind to put away you heat gun, to not blow away the powder. Some on the enamel will stick to the background as well. That’s because it is so hot. But I really like that. So the contrast is not too hard. I used Gelatos to add color. They are working great on the chalkboard. 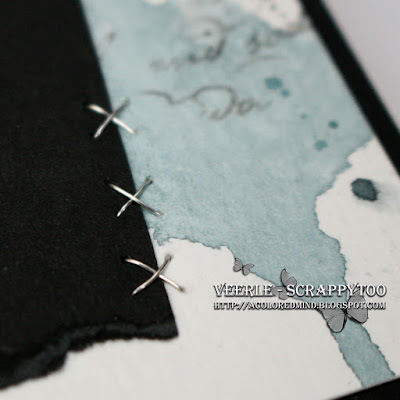 I add some texture with the Tim Holtz Speckles stencil and structure paste. I split the sentiment by masking one part with Washi tape. Don’t forget to remove the tape before you stamp. 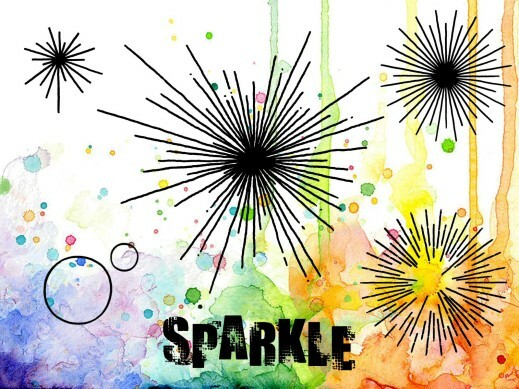 The word “SPARKLE” is embossed with some glitter teal powder. The flowers are all handmade paperflowers. I used dies from Sizzix and Marianne Design. The blue one is cut with my Silhouette Cameo. I add some wire and gems for more interest. My back is totally simple. It’s also covered with chalkboard paint. Of course that means you can write on it with chalk! Thanks for stopping by! Can’t wait to see all your first Monoliths! We will be back tomorrow with the very first Monolith from Kim Johnny! 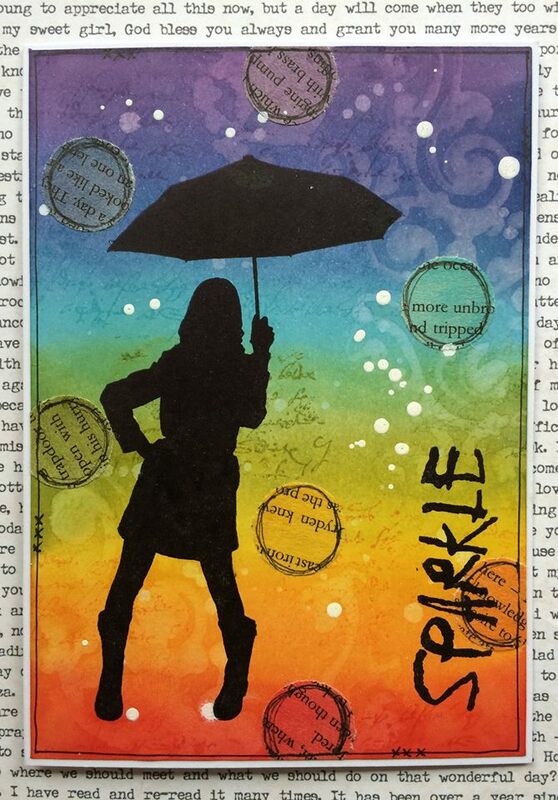 And an awesome card from Kim Bacon… all created with our NEW stamps! watercolor paints and used the same color together with some black to make my background. They have so many new stamps released this month, you definitely should check them out! We still have more awesome inspiration yet to come this evening…. An amazing Monolith from Susanne Rose! Hello! We are back with more exciting NEW stamps inspiration! 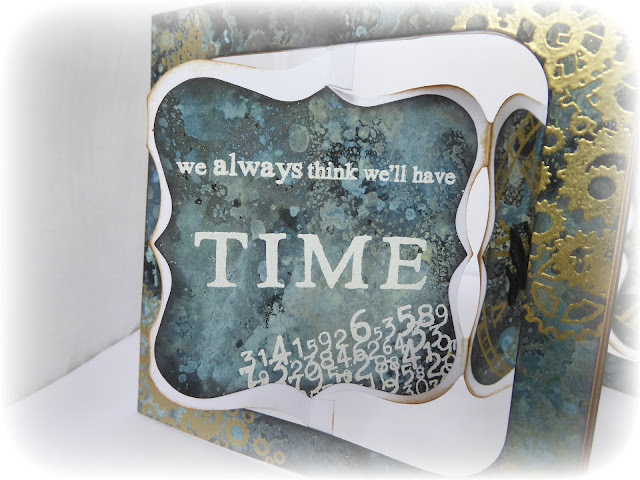 Hello and welcome back for another dose of stamping inspiration. 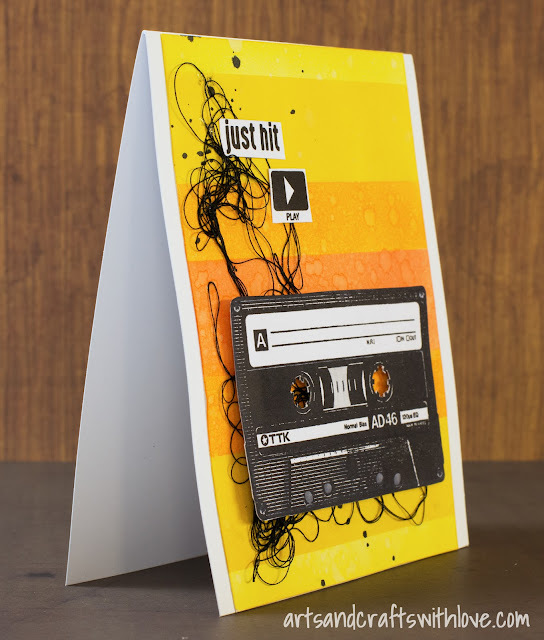 Once again I am sharing another of the fantastic new release designs which is called ‘Just Hit Play’. 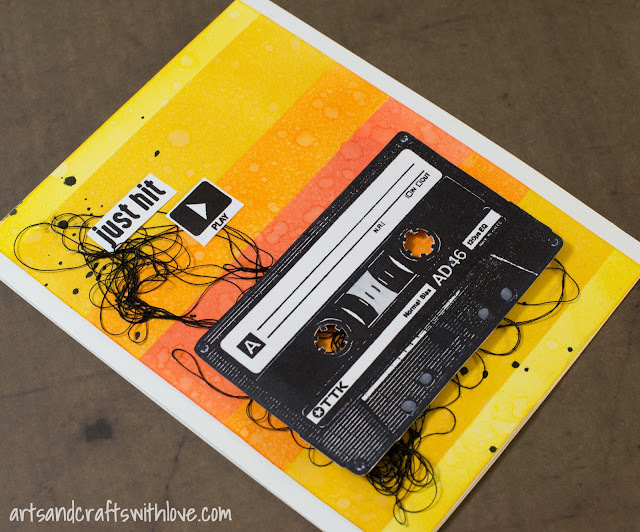 I love the detail in this photo realistic cassette stamp and the funky button icons in the sentiment. I went with some bright (slightly retro) colours to keep this card loud and upbeat. The background is created with Dylusions Spray Inks, and the cassettes were stamped onto white card then carefully cut out then glued in place. The excess was trimmed from around the edges. 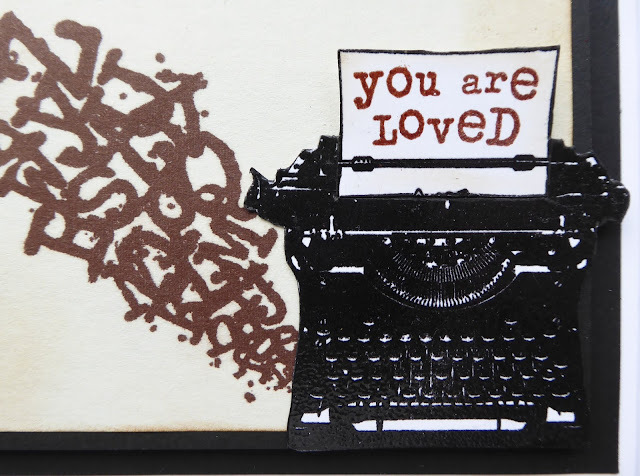 The sentiment was stamped onto a strip of black card then embossed with opaque WOW powders. I hope you are as excited to see these fabulous new releases as we are – all the new designs are now available to pre-order on the website, six of them will be launched on Create and Craft TV on Sunday 14th February. 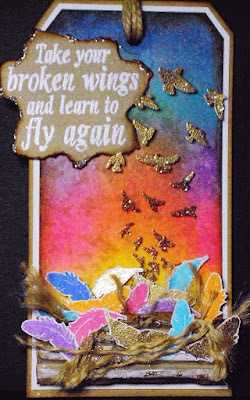 We will be back soon with a stunning tag from Pauline created with another NEW stamp set! We have some fabulous inspiration for you this evening, so let’s get started! and something else altogether completely new ~ MONOLITHS. Monoliths are MDF boards which come with a stand. You can work on both sides. ~ and that is double the fun!!! They are perfect for anything mixed media. 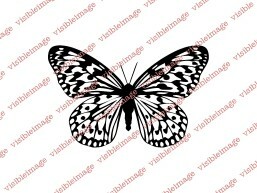 And they come in packs of 5.
in fact…they are specifically designed for our stamps! and forgot to take a pic. Sorry about that. and the other side was dribbled with some alcohol inks…in similar colours. I wanted it to be similar, but different – if that makes sense. The butterflies were stamped onto tissue paper and then applied. (10am) for those who would like to see Mark and Pauline play with the new products. I still haven’t got around to blowing ink around through a Bic pen yet after the last show! it makes the world that bit smaller I think. 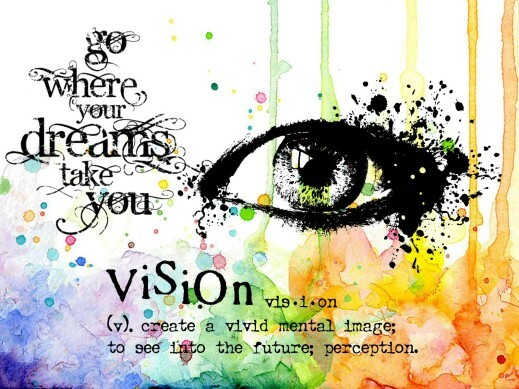 ~ are all things happening with Visible Image over the next few weeks! Busy times!!! And it’s so exciting to be a part of it all. This is absolutely stunning Dot.. the colours and texture are really beautiful ♡ Thank you! It’s been a little crazy here over the last week, with the launch of our NEW designs for pre-order! And making all the stamps for our upcoming show on Create and Craft TV… so sadly the blog has been neglected!!! However… our Design Team have been really busy creating awesome things with our NEW stamps so we have loads of amazing inspiration to bring you over the next few days! I am thrilled to be sharing a project using one of the new stamp sets that will be released on Create and Craft on Sunday 14th February. This set is called ‘Shine Bright’ and is such a cool design!! I have used the stamps to decorate an MDF ‘Monolith’….what’s that? you say….. I base coated the MDF with gesso then added a couple of coats of DecoArt Copper paint. The MDF cogs and pipework (Calico Craft Parts) have been given an antique brass effect using Gold and Quinacridone Gold DecoArt paint. I added the verdigris effect with Patina Antiquing Cream. I wanted the light bulb to stand up by itself and my acetate was too thin, so I stamped it onto Shrink Plastic (do NOT shrink it!!) and cut out. I coated the front with Glossy Accents and attached vellum to the back for the opalescent effect. Some silver foiling on the screw thread added to the realism. The sentiment was embossed in gold onto copper pearlescent card. Thanks for stopping by today and don’t forget to watch the show on Create and Craft TV…. 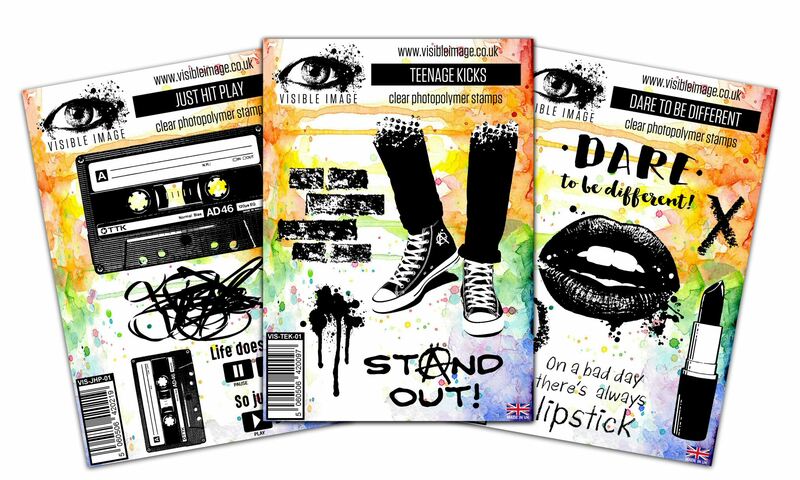 6 new stamp sets will be launched ahead of the UK Trade Show where all 30 new designs will be available to retailers. 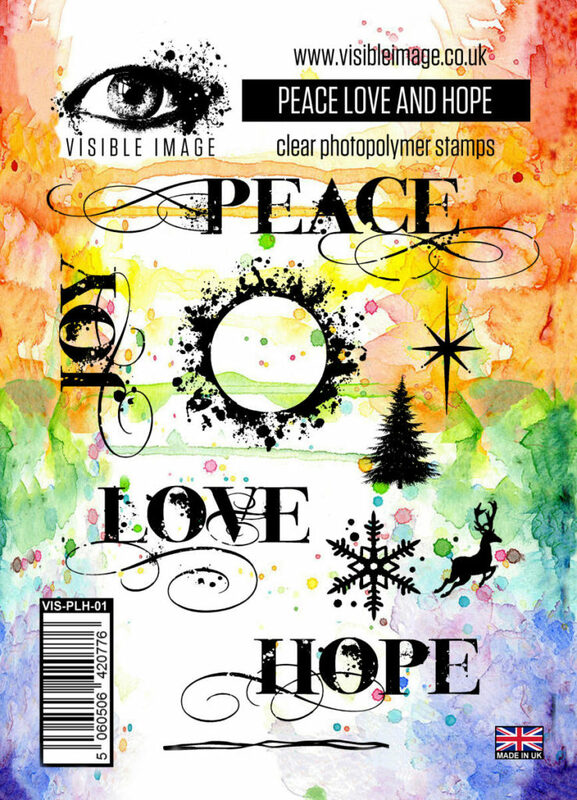 It’s going to be an exciting year for Visible Image, some amazing new stamps…feature images, backgrounds, words, and much more…. You will find all our NEW stamps HERE… they are all now available to pre-order! Hi There! We’re so excited today!!! 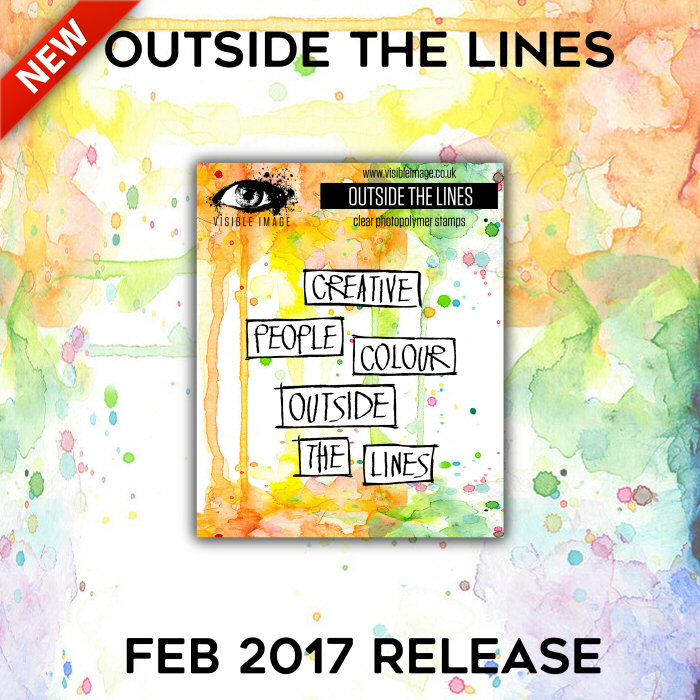 All our February releases are now available to pre-order right here in our online shop! 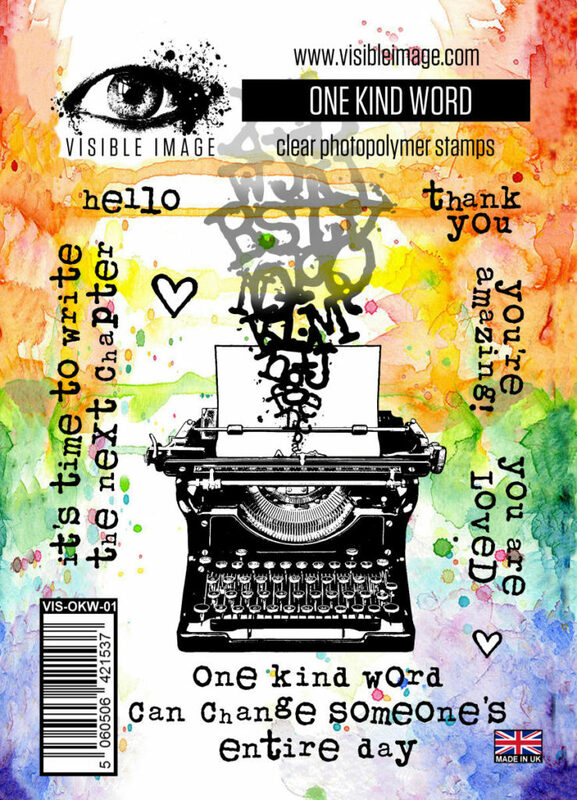 6 awesome background stamp sets! 7 sets of funky geometric shapes! AND 2 very funky geometric alphabets! 9 brilliant NEW quotes to add to our Express Yourself collection! AND our brilliant new MDF Monoliths! We didn’t get to show you everything beforehand as there are just so many new designs! If you have a shop and would like to stock our stamps you’ll find more details HERE. We’d love to hear from you! We will be back soon with loads of gorgeous inspiration from our amazing team, who will be showing you what they’ve been creating with our new stamps so far.